Wondering whether skiing in April is worthwhile? It most certainly is! It is one of the best times of the season and there are some good deals out there to be had. Here are my top 5 tips, which I hope will make your spring skiing holiday one of your most memorable. Even though you are on holiday and like to sleep in, it is best to get up early and enjoy the slopes before the sun hits them too hard and makes them into slushy mega bumps. So set your alarm clock a bit earlier than usual, so you can get on the first lift. You will appreciate this when you’re hitting the slopes and suddenly find yourself alone, with just a few other early birds around you and the piste is like a well ironed shirt. Okay, to get the best out of the day, I’m also telling you to stop early and this is why… The snow typically gets very heavy and bumpy around 12pm, so this is what I suggest. Take a short break in the middle of the morning for something to drink, then stop at a nice restaurant for a late lunch, around 1:30 – 2pm, then sit and enjoy a nice meal (hopefully in the sun) and ski down afterwards for a relaxing afternoon. 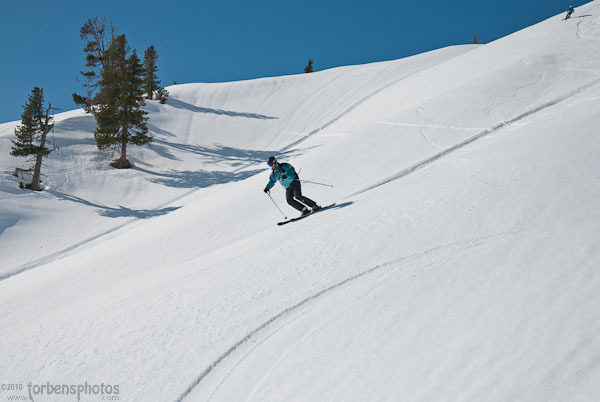 It still gives you about 5 hours’ worth of quality skiing. Chances are the lower runs back down to the village will be the first ones to get hit by the sun’s rays, that means they will also be the first ones to get slushy, but if you get one or two runs in before that happens, then you can move up high, later on, where it’s been colder and the snow is holds up for longer. You will not meet many people doing the same thing (unless they also read these tips), because people typically go straight for the high runs. So down low is where the quality snow will be in the morning and you will get your best runs of the day. There is still plenty of time to send in your entries to be in with a chance to win a custom made beanie thanks to Grannies, Inc.
Just send in your best photos & films from your 2009/10 ski holiday as an e-mail attachment along with your name, address, telephone number and age if under 18 yrs to philli@ski-i.com. It would be great if you could also include a note the location of the photograph and include a short caption to best describe the photo. Terms & conditions: Ski Independence will not be held responsible for any injury or accidents that occur as a result of attempting dangerous tricks or stunts. The winner will be selected by a panel of judges. The judges’ decision is final. 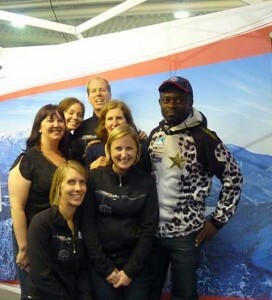 Ski Independence has the right to use and publish any photo entered into the competition. Entries must be received on or before 1st May 2010. There are a couple of travel options for Heavenly – you can either fly with United Airlines to Reno, via San Francisco and then take a 1 hour bus transfer to Heavenly or you can fly to San Francisco with British Airways, and hire a car. The drive from San Francisco to Heavenly is about 3 ½ hours. To allow for maximum flexibility when in resort I opted for the latter option and hired a car. The drive was much easier than I had anticipated. When you leave the airport, heading north on the 101, you aim for the Bay Bridge, then keep on the I-80 East and that is all there is to it. Just keep an eye out for the signs/lanes for South Lake Tahoe and there you are. It was a very easy, and an enjoyable drive. Winter Olympic Experience Day 5: Canada wins gold! Got up at stupid o’clock again to get the shuttle bus up to Whistler village for another slide using the Fresh Tracks ticket. Skied all over Whistler mountain for a couple of hours with a few good powder runs down Harmony Bowl and even a run off the Peak Chair – the sun even came out in time to wave us goodbye. About 11am we skied top to bottom – a great run as there was virtually no-one on the mountain that day due to it being the end of the Games and the Gold Medal ice hockey was just about to start. After a quick shower, I jumped on the airport bus and it was off back to YVR. With a constant stream of hockey updates being texted to us from friends in Whistler we drove through a bizarrely deserted Vancouver and arrived at the airport just as Sidney Crosby (think Wayne Rooney on skates) slotted home the winner in overtime for the Canadians. YVR departures was insane – no-one was checking in, no-one was shopping, no-one was eating – everyone was gathered around the massive video screen cheering on the Canadian victory. Awesome stuff, and a fantastic way to finish the trip. Whistler Experience Day 4: The Snow Leopard & Usher in one day! Another early start. Met our Canadian hosts at 0715 for a home-cooked breakfast at Chez Merrell – I knew it was going to be a fun day as we started with a Caesar (similar Bloody Mary- contains vodka, clamato (a blend of tomato juice and clam broth) , followed quickly by a Mimosa (Bucks Fizz). After a huge plate of waffles and bacon with the obligatory maple syrup, and a tonne of coffee, we walked over to the Olympic venue at Whistler Creekside for the Men’s Slalom race – security was airport style (which I have to say was slightly OTT) before we were allowed access. Once inside the venue we grabbed our seats in the stadium just as the 3 forerunners were skiing the first course. There was live commentary from Chris Davenport and all the video playback and display you could handle on a giant screen. The atmosphere was intense and the venue was packed with loads of different nationalities – we sat beside the ‘snow leopard’s’ supporters from Ghana. The Croatians were all in to watch Ivica Kostelic, the Italians were there en-masse, everyone it seemed had a cowbell to ring, the Russians were there in hordes again and the beer was flowing. Suddenly it was time for the first of the 103 skiers (the top 30 are seeded, then the rest follow). They have a run down the first course, then a run down the second course after a short break – the times are added together and the winner has the fastest overall combined time. The best feature is that the fastest 30 skiers from the first run, then ski in reverse order for the second run – ie: the 30th placed skier in the first run starts 1st in the second run. It makes for a very exciting finale. I was blown away by the talent the skiers showed – the course was steep and very icy and visibility was awful, but they blasted down the course as if they were on rails. Out of 103 starters on run 1, only 53 posted a time and went through to the second run. Jumped on the first bus at Creekside and travelled 5 minutes up the road to Whistler Village to grab our skis from the Salomon store underneath the Pan Pacific Mountainside. I’d rented a new pair of K2 Apache Xplorer all-mountain skis (which turned out to be so good, I think I’ll have to buy a pair). We then walked the 200m over to the Whistler gondola for 7.15am to head up the mountain for full buffet breakfast – this is called Fresh Tracks and is a separate ticket to your lift ticket: you get early access to the mountain and a huge buffet breakfast at the top of the mountain – it is one of Whistler’s best features, especially on a powder day. Today was a powder day! We were up again early to head off to the Callaghan Valley to the Whistler Olympic Park, but first we had a spot of snowshoeing to do along the Medicine Trail with guides from Canadian Snowmobile. I’ve never snowshoed before and I actually loved it – quite gentle walking through mature forest scenery, but with a super-informative guide and a nice breakfast back at their on-mountain base. It was really cool. They also have a snowmobile and dog-sledding operation here, and we got to meet some of the dogs – most were a husky+greyhound cross breed – think small, furry, stocky greyhound with those strange light blue eyes. Very friendly though. It was nice to be back in the mountains with real mountain people who have a real passion about what they do. After the snowshoeing, we transferred to another bus and travelled further up the Callaghan Valley to the Olympic venue for the Nordic events – XC skiing, Ski Jump and Biathlon. Last winter I had the chance to ski some of the XC course, and climb to the top of the 90m ski jump – those guys are nuts by the way. From the top of the ski jump, you can’t see where you land… it just contours away from you. Anyway, I digress. We were here to watch the Ladies 4 x 5km XC Relay – 16 nations were competing (sadly no team from the UK). The format is relatively simple – the first skier from each team completes a circuit of the track skiing classic style, before handing over to the 2nd team member who then does the same. The 3rd and 4th skiers in each team ski a slightly different circuit, this time in free style (more of a skating technique, and much faster). It’s a real sprint relay, with a lot of climbing and subsequent downhill (which if you’ve ever tried to turn a fast, sharp corner on skinny XC skis, makes for an amusing spectator thrill at the corners). The ice maidens from Norway powered to victory – the 4th skier even had time to stop and collect a massive Norwegian flag before skating the last 200m, watched on by the King of Norway no less. The venue was jam-packed and it was a really amazing thing to watch. Canada was last unfortunately….. but got the biggest cheer. Lots of Russians in the same track suit about – very odd. Last week I had a once-in-a-lifetime opportunity to attend some of the events at the 2010 Winter Olympic Games in Vancouver, Canada courtesy of our industry partners Tourism Whistler. After a fairly routine 10hr15mins long haul flight on Air Canada from Heathrow direct to Vancouver, I was slightly bemused to find the baggage re-claim hall packed with staff and visitors watching Canada pound Russia in an important ice hockey match. Lesson 1: Canadians love ice hockey. The arrivals hall was even more boisterous – the whole place was filled with National Teams, VANOC staff, airport staff and visitors going absolutely nuts over the ice hockey. It was a really amazing atmosphere and I was a bit sad to jump on the transfer bus, as the game was only in the second of the three periods. Along the route from the airport into downtown Vancouver there was Olympic branding and Canadian flags literally everywhere – Vancouver has done an amazing job promoting the games. Even the highway road signs were flashing ‘Go Canada’. Bonkers. As the bus reached the centre of Vancouver we passed the ice hockey venue. The game had just finished with a convincing victory for team Canada, and there were fans pouring out of the stadium onto the streets celebrating raucously. Lesson 2: Canadians love to win at ice hockey.